The Nassau County Legislature today unanimously approved County Executive Edward P.Mangano’s public-private partnership with Bruce Ratner’s Nassau Events Center(NEC) to transform the 43-year old Nassau Veterans Memorial Coliseum and Plaza into an attractive, first-class destination for sports and family entertainment. The agreement generates millions in economic benefit for Nassau County while creating and retaining thousands of local jobs. Under terms of the agreement, Nassau County will receive a percentageof revenue with a guaranteed minimum level of revenue-sharing that escalates throughout the life of the contract. NEC is responsible for all construction, renovation and maintenance costs at the Coliseum and Plaza. NEC will transform the Coliseum into a 13,000 seat arena that hosts professional sports as well as family-fun entertainment. The NY Islanders will play a minimum of six games, host two open practices and four training camp days at the Coliseum annually. The Brooklyn Nets will also play at least one pre-season game each year and the NY Yankees will host a coaches clinic annually.The lease ensures that an American Hockey League (AHL) team will play all home games at the Coliseum as well. “This property is vital to the future of Nassau County. The competitive bidding process led to an exciting proposal that puts Nassau residents first. I am very pleased that the County Executive and Mr. Ratner were able to come to terms on a plan that will provide a state of the art, revenue generating entertainment destination at zero cost to the taxpayer,” added Presiding Officer Norma Gonsalves. 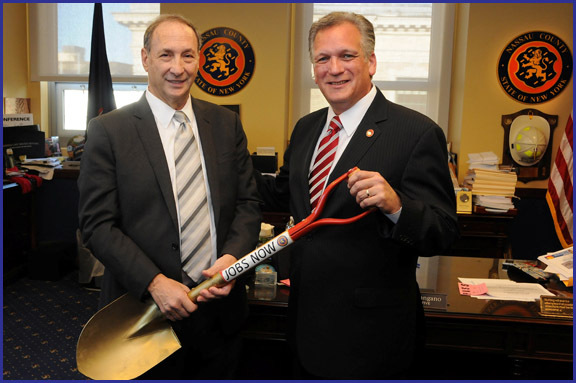 Redevelopment of the Coliseum is the first phase in County Executive Mangano’s economic development plan for the Hub. With a transformed Coliseum, the County will be positioned to attract other uses adjacent to the arena that complement existing educational institutions, financial companies, research and development companies, retailers and others who call the Hub their home. To honor local veterans, NEC has agreed to construct a monument in honor of our hometown heroes and the arena’s name will remain as the Nassau Veterans Memorial Coliseum.